Though the axe is a popular weapon for Danes, wielding a sword shows that the wielder is a man of worth. 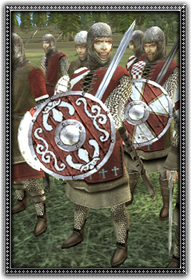 These swordsmen come from minor nobility and have superior training to the common troops. Their station means they can afford decent armour as well, all having at least chainmail, and many upgrading to plate. Well armed and equipped Norse swordsmen. Able to wear chain and plate armour.